Lately I've been absent from blogging in order to join my best friend at her wedding on the opposite coast! As the matron of honor, I felt it was important to have a bit more time to spend to help her as she needed and so I ended up being back on the East Coast for over a month! While I was there though, I did make the best of it and saw many of my friends, and family and even got some extra travel in as well. I spent a sweltering weekend at Williamsburg, which continues to be one of my favorite places, and on my way back across the states stopped in Las Vegas to spend a couple days bonding with my sister. With all of this traveling around, I've learned some important things about myself. I'm a terrible packer. I'm also an amazing shopper. Maybe it was my distraction of trying to get too much done before packing or the fact that this trip was going to last so long, but I still have no idea what I was thinking when I put things in my bags. I brought ELEVEN pairs of shoes with me. I might have worn two pairs out of all of those. I ended up buying at least another five pairs. I packed separates that didn't have their other halves, outfits I never ended up wearing, and almost everything was completely inappropriate for the weather where I was going. Of course almost immediately when I got home I found my packing list that I usually never go anywhere without. If you do even a little bit of traveling in your life, it's worth the time to make yourself or find a packing list. 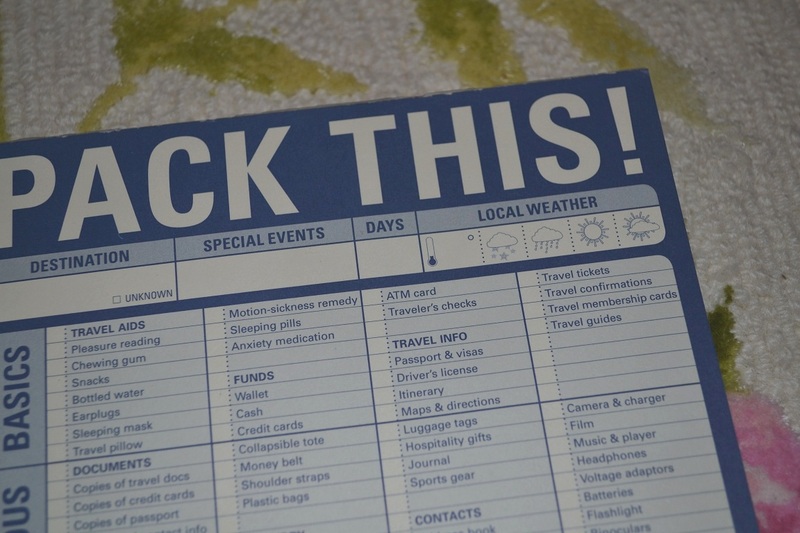 I have a neat little notepad that lists just about everything and then some and even includes sections to write down the location's weather (that would have been helpful...). I never was able to find a free packing list online that I liked and never could wrap my head around making my own list. I'm a very “just pack everything” kind of girl anyway. If you do decide to make your own list, do it when you're not actually packing and look at it every now and again to make sure you didn't forget anything on your first draft. Usually though I do end up checking at least two bags when I travel and I do try to make them count. First I like to pack as efficiently as possible by using Space Bags and packing cubes. Remember that the best way to pack has always been to roll instead of fold. Keeps clothes compact and wrinkle free! 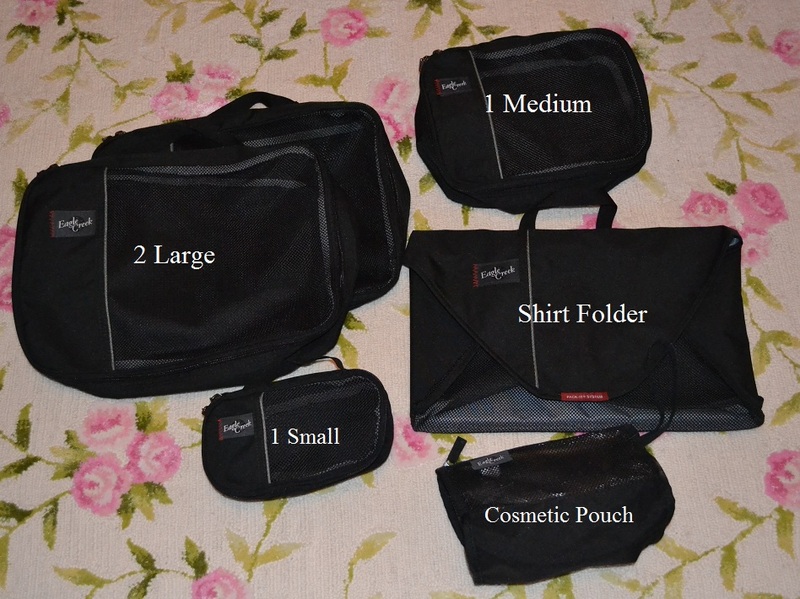 I also always try to pack with me either a large duffel bag (no rollers so it packs flat on the way out) or large tote bag and often times I will cradle my suitcase inside a larger one on the way out so I have an empty suitcase ready to fill up for the way back. These are from Eagle Creek and I've been LOVING them! Click for the larger image! 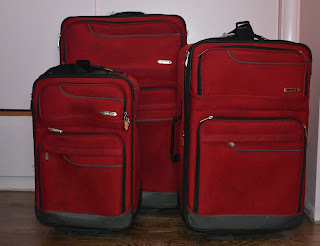 I've always thought about spending lots of money on really cute luggage and I've definitely been victim to a couple of VERY cute roller bags (Sanrio, Liz Lisa), but here are some things to remember when buying luggage. First of all, assume that when your bag leaves your hand it will be dragged through a zoo and be treated like a bug on the floor of a kitchen. These bags get tossed, thrown, dropped, and anything else imaginable. If you don't want your bag to get dirty or broken in some way, then leave it at home. Also do not assume that you'll be able to carry-on your cute bag. More often than not, flights are at full capacity and everyone else has had the same idea. Sometimes you're just not lucky enough to find a place to put your bag in the cabin... and then out the door it goes to be assaulted with all the other checked luggage. Pretty much the only real guarantee you have is that they'll let you keep your purse and your coat. So dirty = Well loved and well traveled! My luggage of choice has been everywhere with me for the last five years or so. It's a matching set that I bought at Target. I didn't spend a ton on it, but it's done the job and I'm never worried about keeping it pristine. I have found that the matching set is so much more convenient for many reasons. First of all, I store each bag inside the next larger one and therefor only have to find room at home for one bag instead of many miss-matched pieces. I bought red luggage thinking I'd be able to find it easier in the airport.... of course everyone else did the same thing! Regardless of color though, it actually does make it easier to look for one kind of red bag instead of a red bag, that green one with the black stripe, the one I borrowed from my mom... you get the idea. Also a note on marking and identifying your luggage, I usually identify my luggage in three places. This isn't just so you can find your bag as it comes off the carousel, it's IMPERATIVE in case someone needs to contact you about your bag (like they've found it after it's been "misplaced"). Remember you DON'T want your bag and your things to end up here: Unclaimed Baggage Center (I totally need to plan a trip there sometime...) First line of defense is the luggage tag securely on the top handle of my luggage. It's a good idea to have your information clearly visible INSIDE your bag as well (like taped onto the top or side of your bag) in case your hanging luggage tag gets lost for whatever reason. My luggage set also has a pocket to tuck a business sized card in with all your information in on the outside of the bag on the back for that extra level of protection. Even though I think of myself as a seasoned traveler, I learned so much on this trip and I hope it'll help all of you too. Happy travels!